How would I be Told about and Emergency? If You are told to Stay Indoors. If You are told to Evacuate. Things to take in the Event of an Evacuation. Locating your Zone and Reception Center. Exit Routes During an Evacuation. Services Provided at Reception Centers. What if My Children are in School during an Emergency? Special Help for the Disabled. Emergency Management Office Phone Numbers Denver is located less than 10 miles from the McGuire Nuclear Power Station on Lake Norman. Operated by the Duke Energy Company, the station is dedicated to the safe, reliable and efficient production of electricity. While the station has had an excellent safety record since it was built, it is still important to be prepared and know what to do if a problem should occur. The information below is provided by the McGuire Nuclear Emergency Planning department of the Duke Energy Company. This information explains the emergency plan and what you should do in case of a problem at the McGuire Nuclear Station. Being informed and prepared can mean the difference between life and death so be sure to review this information often. If you have children be sure to share it with them and have a plan for your family in the event that a problem should occur. 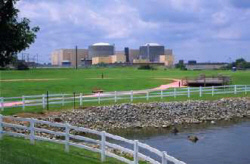 Plan ahead in case an emergency situation should occur at the McGuire nuclear station. Teach your children the plan and how to stay safe. Have a plan for getting back together in case family members are separated from one another in an emergency. Ask an out-of-state relative or friend to serve as the "family contact". Make certain all family members know the name, address, and phone number of the contact person. UNUSUAL EVENT, This is the least serious of the four classifications. It means thereis a minor problem at the sation. Because of strict federal regulations, a number of problems are reported as "unusual events" even though they pose no danger to the public. ALERT, This is an event that could reduce the station's level of safety. There would still be no danger to the public. County and state officials and Duke Energy would get emergency operation centers ready for use, if needed. SITE AREA EMERGENCY, This is an event that could involve major problems with station systems. State and county officials would sound sirens and prepare other means of notification. The public should listen to a local radio or television station in their area for information and instructions. GENERAL EMERGENCY, This is the most serious of the four classifications. State, county and local authorities would take action to protect the public. Sirens would be sounded and the emergency alert radio stations would give information and instructions. People in affected areas would be advised to stay indoors or to evacuate. How Would I be Told about an Emergency? If there were an emergency at McGuire Nuclear Station, The Duke Energy Company would immediately tell state and county officials. These officials would notify you of the emergency and what action you should take. To warn you of an emergency, county officials would sound sirens around the station. The sirens would sound repeatedly in an emergency. In case of an emergency, fire, police and rescue units may patrol the affected area and sound their sirens. In case of an emergency boaters on the surrounding Lakes and rivers would be alerted. Local radio and television stations will carry an emergency alert and provide information on what actions to take. Emergency sirens will sound repeatedly to tell you of a problem. If you hear a siren, immediately turn on your radio or television and tune to the stations that will carry an emergency alert message. The sirens may also be used to warn you of a storm or other emergency. If you hear no message on radio or television, call your county's Emergency Management Office. The phone numbers are listed on the Emergency Phone Numbers page of this web site and can also be found in your local telephone directory book. NOTE: Hearing a siren does not mean you should evacuate. Sometimes staying indoors is actually safer than evacuating. Tune to a radio or television station for instructions from emergency officials. You may be told to Stay Indoors or you may be told to Evacuate. Emergency officials will know which is better. Follow their instructions! Stay indoors until you are told it is safe to go out. Turn off fans, air conditioners, heat pumps and forced-air heat and any other equipment that brings in outside air. Go to the basement if possible. If you don't have a basement, go to a downstairs room in the center of the house. It should be a room without windows or outside doors. Listen to the local radio stations listed above for information from emergency management officials. They will tell you what to do. Water, milk and food supplies will be checked for radiation. Government officials will tell you if these are safe. Do not try to take all of your things with you. Turn off appliances and faucets. Get into you vehicle and close all windows and vents. Drive to your designated reception center and register. State health regulations do not allow pets in reception centers. If you are not planning to stay at the reception center after registering you may take your pets with you when you evacuate. Otherwise you should make arrangements for your pets and livestock. Leave adequate food, water and shelter for your animals, enough for at least several days. NOTE: It is important that you go to a designated reception center and register! The reception centers are equipped to check you for radioactive material and remove it if found. This process, called "decontamination" is very important as it reduces the radiation dose to yourself and others. Refer to the section on "Radiation and It's Effects" later in this document. Local emergency management officials need to know who has evacuated as well as where and how to contact you with important information. Two changes of clothing for each person. Two blankets or a sleeping bag for each person. Toiletries such as soap, toothbrush and toothpaste, etc. Special baby formulas or food and diapers. Battery operated radio, flashlight and batteries. NOTE: If you are going to a reception center for housing or assistance, you must bring an identification card showing your address. The McGuire Nuclear Station Emergency Plan divides the local area in a 10 mile radius around the station into "Protective Action Zones". Each zone has a "Primary Evacuation Route" and corresponding "Reception Center". In the event of an emergency at the McGuire Nuclear Station it is not likely that everyone within the 10-mile area would be affected. The areas affected would depend on weather conditions and the nature of the emergency. You should look at the McGuire Nuclear Station Protective Action Zones and Reception Centers Map and find the zones where you live, work and/or go to school. You should also look to locate the designated reception center of the zone(s) you are in. This is where you should go if there is an evacuation of the zone you are in. You can locate the designated reception center for a particular zone on the McGuire Nuclear Station Protective Action Zones and Reception Centers Map provided on the this web site. The route you should take in the event of an evacuation depends on the "Protective Action Zone" that you are in. To find the exit route for a particular zone you can refer to the McGuire Nuclear Station Protective Action Zones and Reception Centers Map provided on this web site. Routes would also be announced on local radio and television. Law enforcement officials would direct traffic during an evacuation. If possible you should use car pools in your neighborhood to limit traffic and please, DRIVE SAFELY. You can stay at the reception center if you choose to. Reception centers are managed by people from service organizations, like the Red Cross. Decontamination facilities, if necessary, will be provided at the reception centers. Schools in the area around the McGuire Nuclear Station each have specific emergency plans for the children at that school. In an emergency, school officials would be contacted by county emergency management officials. If an evacuation were ordered, all children would be moved by bus to the reception center for their school. All reception centers are more than 10 miles from the station. Adults would care for the children until parents arrive at the reception center. Parents should pick up students at the reception center only. DO NOT GO TO THE SCHOOLS. This will help avoid delays. It is important for parents to know in what zones their children's schools are located. To find out refer to the School Protective Action Zones and Reception Centers Chart. If your children are ever left home alone teach them what to do in an emergency. Be certain that they know what zone they are in. County emergency personnel will notify people with special needs during an emergency and evacuate them if necessary. If you or someone you know is visually impaired, hearing impaired, physically disbaled or has special needs, call you emergency management office today. Tell them of the special need. This information will remain confidential. Monitor and follow instructions given over the emergency alert system. Specific recommedations for the protection of farm animals and agricultural products will be issued by appropriate state and county officials. Remove all dairy animals from pasture, shelter if possible, and provide them with stored feed and protected water. Protected self-feeders and automatic livestock watering equipment are the most effective. Store feed in buildings, or cover it if outdoors. Feed stored in buildings will be protected from contamination. Cover the feed with plastic or canvas. Cover open wells and water tanks. The state of North Carolina has published special brochures concerning livestock, crops, and gardens. Residents may request a copy by contacting the county cooperative extension agent.